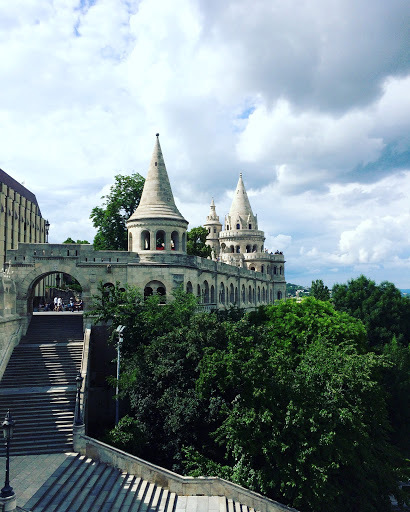 We arose and used the Chain Bridge to cross over from Pest to Buda. The chain bridge was the first permanent bridge across the Danube, constructed in 1849 and is quite significant in the history of Budapest. Today it sits upon the river as an engineering wonder and walking across it gives you some fantastic views of the city. Once over the bridge you will find the funicular to take you up to Castle Hill but on both my visits I have walked up instead using the pathway to the left of the lift. It’s not a difficult climb at all and there are more chances to get lovely pictures! 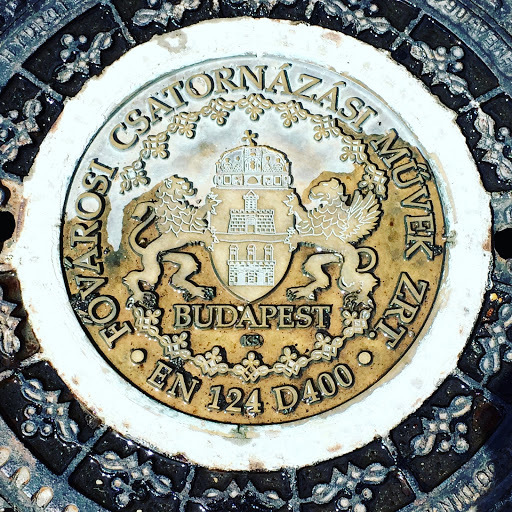 Upon Castle Hill you will find many of Budapest’s most historically important buildings. A world heritage site, it has so much to see. There are no cars up on the hill which makes it even more enjoyable to walk around. 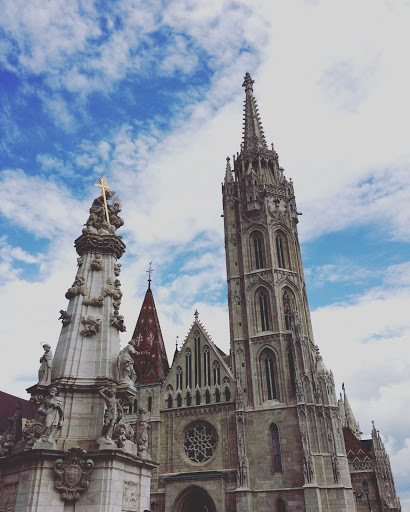 We headed to one of the highlights of the hill, Matthias church. It was originally built in 1015 however has been rebuilt since then. The church is named after the king who restored it in the 1800s. I think it has a really interesting look to it with its orange diamond roof tiles. 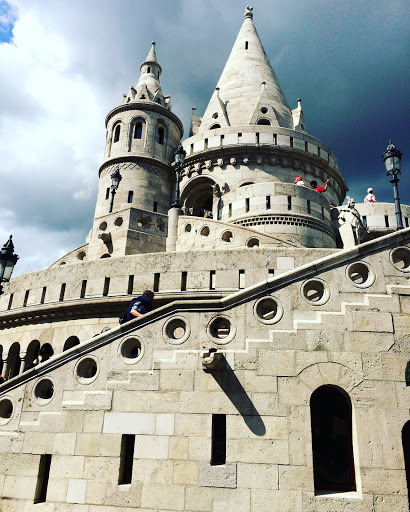 Next to the church sits Fisherman’s bastion, an interesting looking terrace built around 1900 and gives you amazing views over to the Pest side. 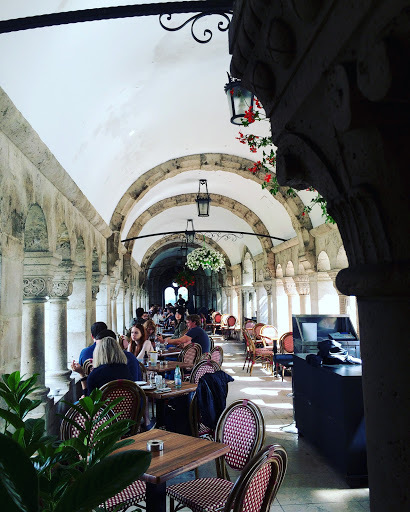 The terrace is named after the fishermen that used to keep watch over the city walls in the middle ages. I really love the look of the terrace, I think it looks like it belongs in a fairytale! 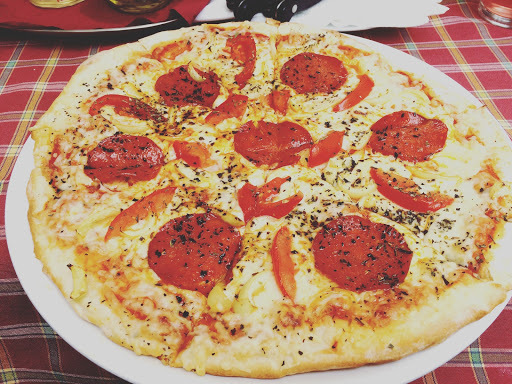 We were pretty hungry after our walking so we stopped at a place down a side street, Mezeskalacs Kavezo, where we grabbed a yummy pizza and a glass of wine at a really reasonable price. The location was really nice and quiet and the staff were friendly. Stuffed from lunch we headed to Hospital in the Rock. I had so wanted to visit here when we came in December but it was closed for the holidays. Happily it was open and we were able to join one of the 60 minute tours. 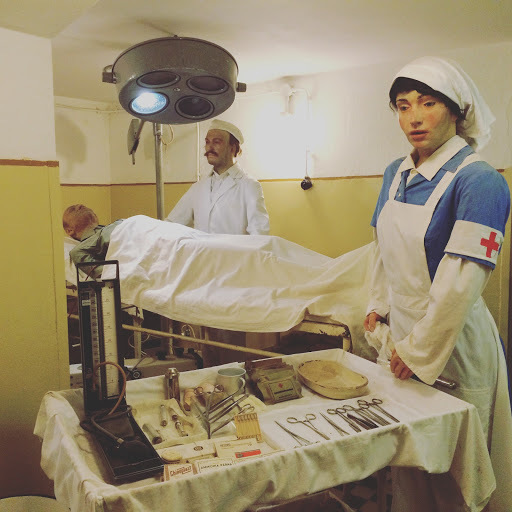 The museum was originally a hospital in WWII and is built into the caverns under the castle. 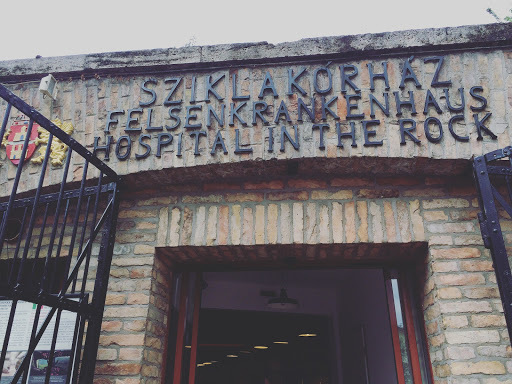 At one point it was being used to treat up to 600 wounded soldiers. It was one of those places where they had creepy waxwork figures (200 of them!) showing how the hospital used to look but it was so interesting. The guide gave us a detailed history of the place and there was so many genuine pieces around to look at. In fact you could even buy genuine items in the gift shop! 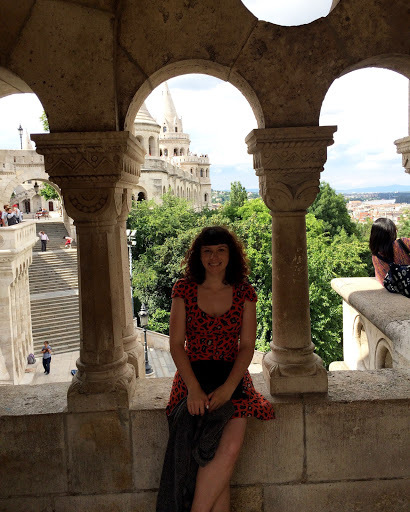 Although the original plan had been to explore the Citadella and the castle itself but we ran out of time as we had a reservation for a wine tasting at 5pm. 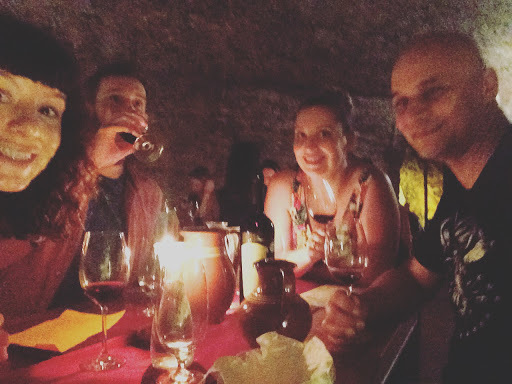 Our wine tasting was taking place at the amazing Faust Wine Cellar. We had made a reservation before coming because the space is quite small. The cellar is a pretty impressive location, deep underground. We went for the package that included 5 wines that were recommended by the sommelier. 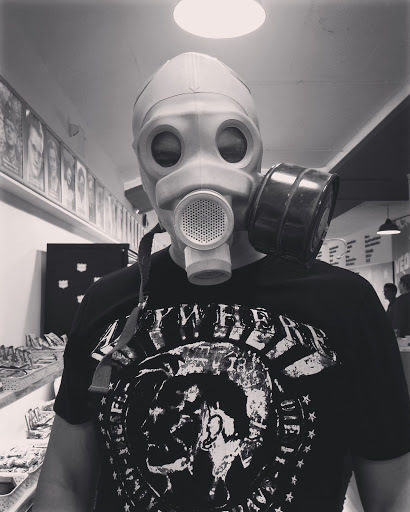 It was 5500HUF which is about £14. I think that is fantastic value for the experience. As well as try some beautiful wines we had a very dedicated sommelier who talked us through each wine in a humorous and informal way. It was really such a shame we only had hand luggage otherwise I would have bought a few bottles to take home. I apologise for the poor photo but it was dark in there and there was a no camera policy so it was only a sneaky pic. We got some lovely cheese scones, fresh from the oven, during the tasting but after all that wine we left feeling peckish. 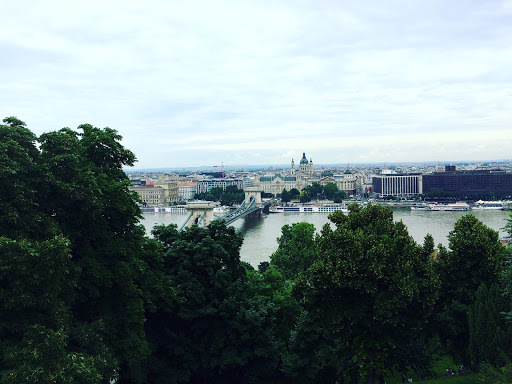 We headed back to the Pest side and started walking back to our apartment and stopped at Jack’s burger on the way. It was reasonably priced and did the trick at satisfying us. Sitting outside in the sunshine was lovely. 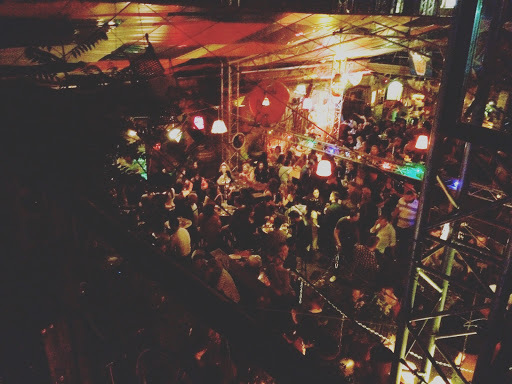 After getting changed at the apartment we headed out to Szimpla Kert. I wasn’t sure how busy it would be as when we visited in December we gave it a miss after seeing the vast queue outside but this time we walked straight in. It was really impressive and I was surprised at how big it was. The drinks were really reasonable and there was so much to explore. It was pretty busy and it was difficult to find somewhere to sit but it was a really good atmosphere. 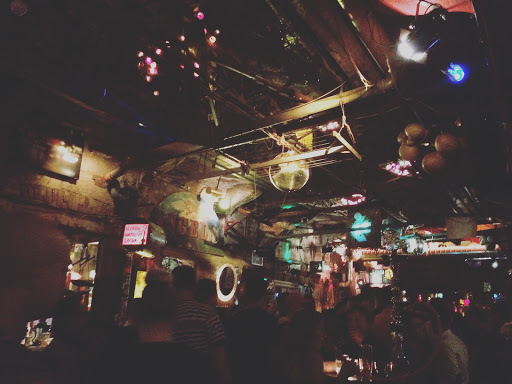 A few hours later we left Szimpla Kert and started heading back to our apartment and decided to stop at Rumpus Tiki bar, a funky Hawaiian bar that we had noticed before. 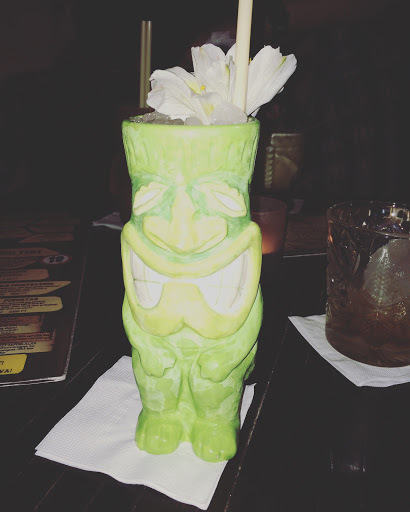 It was a little bit more expensive than the other bars but holy moses, the cocktails were beautiful and served in cute tiki glasses. It was a really great night!